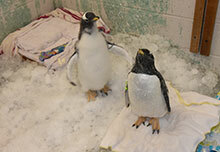 Our Gentoo penguin chicks are growing up fast! Oscar and Fiona are the parents of the first chick, Tilly, a female who hatched on January 4. The parents of Sherlock, the second chick, who is male and hatched on January 9, are Felix and Olive. 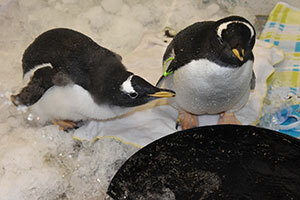 Both sets of parents have reared chicks before, and with Gentoo penguins, both parents alternate nest duties and take turns feeding and caring for their chicks. Visitors can tell Tilly and Sherlock apart by the color of their bands—Tilly’s is green, while Sherlock’s is gray. The chicks are now being reintroduced to the exhibit, gradually learning about the pool, feeding time, interacting with the other birds in the exhibit and other important penguin skills! Penguin chicks do not automatically know how to swim, and need to build these skills over time. The chicks’ diet consists primarily of capelin, a small forage fish, and they each consume about 40 capelin per day. The chicks currently rotate sporadically between the exhibit—where they can be supervised by keepers as they become more comfortable in the water—and an adjoining area. As they become stronger swimmers over the coming weeks, keepers will increase the amount of time they spend on exhibit.